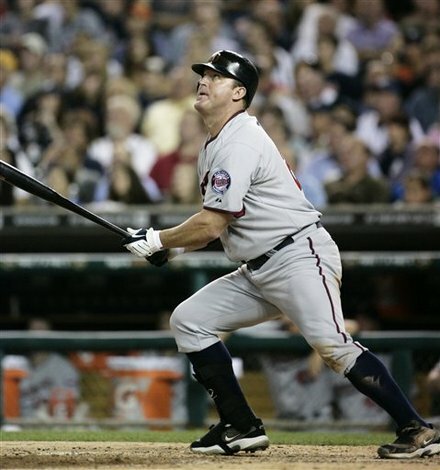 On Monday night, the Minnesota Twins' designated hitter Jim Thome mashed a homerun at the Major League level for the 600th time, becoming only the eighth man ever to do so. Over what has been beyond an impressive 20-year big league career, Thome has become one of the game's most renowned sluggers, while playing for five different teams. Somehow, though, what would previously have screamed the biggest story in sports, when heavy hitters of the past reached landmarks or chased records, has now had its volume turned way down as one of the game's most liked individuals, Thome, approached the 600 HR plateau. That lack of great buzz could make some wonder why Thome's approach toward the beastly breakthrough wasn't afforded as much attention as previous baseball milestone's. To discuss those concerns and to address Thome's legend specifically, I asked some friends of this site to offer their thoughts. -Where does Jim Thome rank among the game's all-time best homerun hitters? Jim Thome is a throwback player, someone who would have been a slugger in any era. He just seems like he belonged in the 50's or 60's, or at least the way we romanticized baseball back then. Where does Thome rank all time? As one of its best sluggers. He played in an era where on base percentage was valued and batting average lost appeal. The knock on him is that he was a totally one-dimensional player, but as a hitter? There were few guys with more power. Historically? He's the modern day Reggie Jackson, except for that whole October thing. To hit 600 homeruns across two leagues says something about the hitting of Thome. He has been a guy who has gone from role player to DH without skipping a beat. The greatest thing about Thome is that he has done all this without having his name mentioned with performance enhancing drugs. Thome is a hitter's hitter. Unlike Matt Stairs, who admittedly tried to crush a homer every time, Thome approached the plate to hit. And lucky for him, it left the yard a couple or 600 times. Unfortunately, this is of great concern to me. While the few news features I've seen regarding Thome's 600th homerun have, in some way, asserted that he is one of the game's most liked stars, the limited attention to this milestone, compared to landmarks reached in recent years, genuinely has me concerned about Thome's importance in many folks' minds. Barry Bonds was widely known to be an objectionable figure, and he got tremendous amounts of attention as he chased the single season and all-time homerun records over the past decade. Nice guys finish last? -Does the 600 HR milestone still mean the same as it once did? I think 600 HR means a great deal even now. It says something about longevity and continued excellence. A lot of the "steroids stars" burned out and didn't have the career milestone that 600 signifies. I guess you can say 600 is the new 500. The prevailing sentiment regarding Thome’s home run total doesn’t appear to be earthshaking, because 600 home runs doesn’t seem like a big deal anymore. But it is. Only seven other players in history have accomplished it. The lack of enthusiasm this time around is a reflection of the times; and the feeling that at least three of the last four players to reach 600 home runs did not come by that total in the most honest of ways. I think that 600 means less today than it has in the past. I do think that the 600 club is more relevant than the 500 club. I think that Thome has had a legitimate career never being suspected or named by anyone. To my knowledge he wasn't named on the congressional report, by Canseco or by anyone else. He's been consistent, hasn't had an odd growth spurt or pattern and hasn't broken down the way a PED user likely would. He has been injured a considerable amount in recent years, but not with typical PED tainted injuries. Exactly as Olshin said, in the theme of Jay-Z's "30's the new 20", in Major League Baseball these days, 600 HR is the new 500 HR. Growing up, I owned a video, hosted by Bob Costas and Mickey Mantle, which reviewed the greatest sluggers ever- The 500 Homerun Club. At that time, it was an extremely exclusive circle, with just 14 members. Since Phillies Hall of Famer Mike Schmidt joined that group in 1987, another 11 members have followed. The previously elite clique is now getting too easy to crack. This next level achievement by Thome is massive and is worthy of a great amount of attention. -Is Thome's place in history affected by the era in which he played? There will always be people who de-emphasize longball numbers in the 90's and 00's. But Thome was a great, consistent slugger when compared within his own era. And that's probably the fairest way to do it. I believe his place in history is affected both positively and negatively by the era he played in. On the one hand, milestone numbers, especially with the long ball, are not paid the attention or reverence they once were because of steroids. On the other, the lack of steroid rumors or positive tests surrounding him make him one of the likable guys. The steroid era has, unfortunately, cast a shadow of doubt over all of baseball’s power totals—one of an infinite number of compelling reasons for their prohibition. Barry Bonds broke two of baseball’s unbreakable records, and fans yawned, knowing just by the size of his head that he was aided by chemicals. This was followed by A-Rod and Sammy Sosa passing the 600 mark, both of whom were credibly accused and don’t have much clout in the trustworthiness category; A-Rod just because he’s A-Rod, and Sosa because he had been busted with a corked bat in the past. But I’m not going to get into a semantic debate about it here. Thome, to my knowledge anyway, has never been credibly accused of PED use, nor has he been involved in any personal scandals. For all of his achievements on the field, at least publicly anyway, Thome also has an image of being a decent guy off of it. I don’t know him personally obviously, and I was saddened to learn Kirby Puckett wasn’t such a wonderful human after all. But for now Thome not only deserves the benefit of the doubt, he deserves accolades for an incredible achievement that only seven players in history have accomplished, even with the help of drugs. I think has place in history will be lessened by the poor choices by some of his peers, but for me he is one of the best real power hitters of our time and just country strong. He was also a really good well rounded hitter in Cleveland, and beyond, for most of his career, in terms of average for a true power hitter. He absolutely is a Hall of Famer. The only thing that could keep him from being a first ballot HOF'er is the real lack of position. It seems like the performance enhancing drug accusations of others have affected the way fans of baseball regard power totals. There's probably not much else to blame when, by comparison, Derek Jeter being the 28th man to do something (reaching 3,000 career hits earlier this season) gets wildly greater amounts more fanfare than Thome does, being the eighth player ever to accomplish a similarly longevity dependent feat. I rooted for Jim Thome in his pursuit of 600 home runs. He has been one of the most consistent, prolific and likable baseball players over the last 20 years. His "country power" and clean perception have elevated him in fans mind, and rightfully so. Aside from Ken Griffey, we haven't seen a player get to 600 homers without a cloud of performance enhancing drugs in a long time.